In recent years, United States policymakers have made 30-day hospital readmission reduction a centerpiece of efforts to curb Medicare costs. In the general Medicare population, 15% of patients are readmitted to the hospital within 30 days of discharge (1), and unplanned rehospitalizations cost >$20 billion per year (2). In fiscal year 2013, Medicare began levying financial penalties against hospitals with higher than expected readmission rates via the Affordable Care Act’s Hospital Readmissions Reduction Program. The readmission problem is even more dire among individuals receiving maintenance dialysis; 30-day hospital readmission rates are >35% in this vulnerable group (3). To incentivize readmission reduction in the dialysis population, the Centers for Medicare and Medicaid Services implemented the standardized readmission ratio, a pay for performance quality measure for outpatient dialysis clinics, in 2017. Such performance-based policies have created urgency in the broader United States health care system and the dialysis community, prompting efforts to describe and quantify readmissions and more importantly, identify modifiable, population-specific risk factors. Using a variety of data sources, investigators have identified a range of readmission risk factors in the hemodialysis population. Patient-related factors, including comorbid conditions (heart failure , myocardial infarction , malignancy [4,5], and depression ), biochemical markers (anemia  and hypoalbuminemia ), and dialysis-related factors (shorter vintage  and catheter vascular access ), associate with increased 30-day readmission odds. Hospital-related factors, including prior hospitalization history (5) and weekend day discharge (5), also associate with increased readmission odds. Finally, provider-related factors, such as erythropoietin-stimulating agent adjustment (7) and more frequent provider visits posthospitalization (9), associate with decreased readmission odds. Although some of the identified risk factors are not readily modifiable, they do point to high-risk subpopulations to potentially target with interventions. In this issue of the Clinical Journal of the American Society of Nephrology, Chan et al. (10) provide insights into 30-day unplanned readmission rates and their predictors among United States patients on hemodialysis with and without medical insurance. Using data from the 2013 Nationwide Readmissions Database (NRD), a publicly available data source that contains information on community hospital discharges from 21 states, the authors (1) describe the rate of 30-day unplanned hospital readmissions, (2) evaluate the concordance between primary discharge diagnoses of index hospital admissions and subsequent readmissions, and (3) identify predictors of readmission among individuals receiving maintenance hemodialysis. Of the 390,627 eligible index hospitalizations identified, 87,302 (22%) resulted in at least one unplanned 30-day readmission. The primary causes of index hospitalizations and corresponding readmissions (on the basis of the Agency for Healthcare Research and Quality Clinical Classification Software [CCS] categorization) were often disparate. Approximately 80% of index hospitalization-readmission pairs had discordant primary discharge diagnoses. Notably, patients who had three or more readmissions in the 30-day period after index hospitalization constituted only 2% of patients but accounted for 20% of readmissions. Several comorbid conditions (e.g., drug abuse history, heart failure, diabetes, and depression) were associated with increased 30-day readmission odds. Study strengths include the large sample size and use of the NRD, a unique data source that facilitated the assessment of 30-day unplanned readmissions in a hemodialysis cohort without restriction by insurance status. The authors used NRD-based population weights to generalize the 21-state sample to a nationally representative cohort. Inclusion of patients with and without insurance and the ability to distinguish elective from nonelective admissions differentiate the NRD from the Medicare-based US Renal Data System (USRDS), the most commonly used United States dialysis data repository. Chan et al. (10) acknowledge several study limitations, including a lack of data on previously identified hospital readmission predictors, such as race, dialysis vintage, vascular access type, missed dialysis treatments, laboratory results, and hospital discharge day. Additionally, categorization of diagnosis codes by CCS groups may have misclassified some related index hospitalization-readmission discharge diagnosis pairs as discordant. For example, index hospitalizations for acute myocardial infarction (CCS code 100) were considered discordant from readmissions for chest pain (CCS code 102). Finally, the NRD does not contain information on the competing risk of out of hospital death, precluding appropriate analytic handling of individuals who died within 30 days of index hospitalization discharge without readmission. Such patients could not be identified in the NRD and were classified as having no readmission. These data limitations highlight the challenges of using a single data source when studying the complex, multifaceted phenomenon of hospital readmission. To date, the majority of investigators have relied on the administrative claims–based USRDS to study readmissions among United States patients on hemodialysis (4,8,9,11). Others have used electronic health record (EHR) data, including dialysis provider and hospital EHR databases (5,7). Study results must always be considered in the context of data source limitations. For example, administrative data, like the USRDS and the NRD, are collected for billing and reimbursement purposes and may have diagnostic and outcome validity shortcomings that affect clinical risk prediction. In addition, administrative data sources do not contain information on known readmission risk factors, including dialysis treatment characteristics, laboratory test results, comorbid condition severity, and social-behavioral characteristics. Compared with administrative claims data, EHR data are more granular and less likely to be influenced by reimbursement-related coding decisions. EHRs offer a highly detailed account of patients’ clinical data and medical histories, but EHRs in the United States are not standardized, making data synthesis across health care systems difficult. Additionally, provider notes and other EHR-based text fields may contain pertinent prognostic information. However, extracting meaningful information from unstructured data on a large scale is challenging and requires specialized tools, such as natural language processing software. Hospital EHRs include key information on hospital-based complications as well as laboratory and diagnostic test results but typically lack detailed information about longitudinal ESRD care and outpatient dialysis treatments. Dialysis provider EHRs, however, contain outpatient dialysis–related information and laboratory results. Unfortunately, few dialysis provider EHRs link to hospital EHRs, preventing simultaneous consideration of potential outpatient- and inpatient-derived readmission risk factors. Finally, EHR systems offer the potential for warehousing patient-reported data, such as health literacy and social support, factors shown to associate with readmission among patients on dialysis (6). However, these data are not captured routinely. Greater attention to patient-reported data collection is needed. Although multiple observational studies have identified 30-day hospital readmission risk factors using these diverse data sources, there is surprisingly little published data evaluating interventions designed to reduce readmissions. Wingard et al. (12) recently reported findings from a nonrandomized intervention that included structured posthospital follow-up, care coordination, and a centralized call system for provider information exchange in 26 dialysis clinics. The authors showed modest overall 30-day readmission declines but found no statistical difference in pre- to postintervention readmission change between intervention and control clinics. When assessing the effect of reimbursement policies on readmissions, Erickson et al. (11) found that the 2004 Medicare payment reform incentivizing more face to face provider visits with patients on dialysis did not affect all-cause readmission rates. These somewhat disappointing findings underscore the need for innovative, integrative data analytics in readmission risk modeling and a greater emphasis on testing and refining readmission prevention strategies. The Model for Improvement suggests using a series of rapid Plan-Do-Study-Act (PDSA) cycles to test and adapt health care change interventions, such as those directed at readmission reduction. Population-specific data are an integral feature of all PDSA steps, used to plan, analyze, and iteratively refine interventions (Figure 1). Given the noted limitations of single-data source reliance, there are multiple opportunities to improve risk prediction in the dialysis population. For example, integrating data from multiple sources, including administrative claims and inpatient and outpatient EHRs, and then supplementing these traditional sources with unique linkages to data from wearable health-monitoring devices, the US Census, and the National Centers for Environmental Information would facilitate simultaneous consideration of an array of potential patient-, dialysis-, hospital-, provider-, socioeconomic-, and environmental-related readmission risk factors. Additionally, application of advanced predictive analytics, including real-time risk modeling and machine learning, may improve risk prediction, ultimately facilitating more individualized service provision at hospital discharge. Using diverse integrated data from multiple sources to inform all steps of PDSA quality improvement action cycles may improve risk prediction, intervention implementation and refinement, and ultimately reduce 30-day hospital readmissions among individuals receiving maintenance dialysis. EHR, electronic health record; PDSA, plan-do-study-act. Thus far, in the quest to reduce 30-day hospital readmissions among patients on dialysis, the nephrology community has spent much time in the planning phase. However, in PDSA cycles, action is essential. 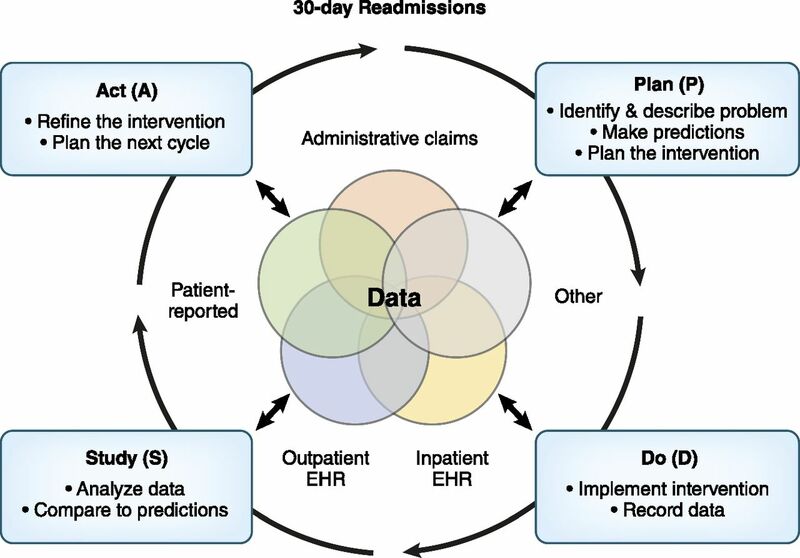 To make inroads into the ESRD readmission problem, we must implement, analyze, and improve interventions, accepting that PDSA cycles are iterative, require continuous refinement, and must be informed by population- and system-specific data. Fortunately, we anticipate that emerging data from integrated care models, like ESRD Seamless Care Organizations, will be highly informative and accelerate rapid cycle quality improvement directed at reducing readmissions. Findings from Chan et al. (10) and others shed light on potential readmission reduction strategies to bring forward to the “do” phase. Examples include (1) targeting individualized discharge services to select subpopulations, such as those with depression, substance abuse, poor social support, or low health literacy; (2) performing time-updated risk stratification accounting for changes in patients’ medical, social, and functional status; and (3) establishing collaborative data exchanges to enhance communication across health care providers and settings. American philosopher John Dewey said, “A problem well put is half-solved.” The problem of 30-day hospital readmissions among individuals receiving maintenance hemodialysis is increasingly “well put.” The next step is to see that the problem is also well solved. M.M.A. and J.E.F. have received investigator-initiated research funding from the Renal Research Institute (New York, New York), a subsidiary of Fresenius Medical Care, North America. J.E.F. has received speaking honoraria from Dialysis Clinic, Incorporated (Nashville, Tennessee); Renal Ventures (Denver, Colorado); American Renal Associates (Beverly, Massachusetts); the American Society of Nephrology (Washington, District of Columbia); Baxter (Deepark, Illinois); the National Kidney Foundation (New York, New York; and multiple universities. M.M.A. is supported by National Institute of Diabetes and Digestive and Kidney Diseases of the National Institutes of Health grant F32 DK109561, and J.E.F. is supported by National Institute of Diabetes and Digestive and Kidney Diseases of the National Institutes of Health by grant K23 DK109401. See related article, “National Estimates of 30-Day Unplanned Readmissions of Patients on Maintenance Hemodialysis,” on pages 1652–1662.